I promised my kids that we will be going to Dallas, Texas to visit the Dallas Zoo and the Dallas World Aquarium on Spring break. Dallas is only 3 hours or 150 miles away from my house. I can drive as long as I have the GPS but lucky me, hubby was available that day so he did all the driving. We made it to the zoo but unfortunately not at the aquarium, the place was so crowded and the line for the ticket booth was so long so hubby decided to leave to go back some other day. 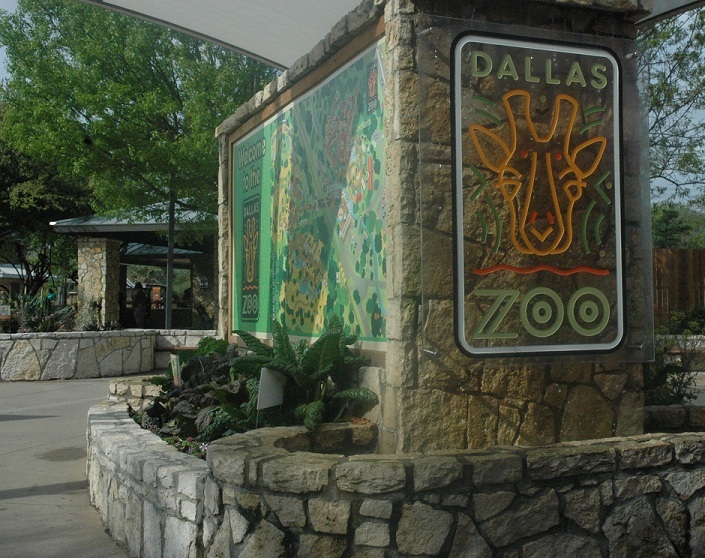 Dallas Zoo, founded in the spring of 1888 when a man from Colorado City offered to sell two deer and two mountain lions to the City of Dallas and placed them in the City park, the first city-owned and operated park. Although the Zoo was a very popular attraction, City Park lacked sufficient space to house all of the animals properly and citizens voiced interest in a more fully developed zoo. It was later moved to Fair Park in 1909, making it the second home of the Dallas Zoo. Due to an expanding and prosperous State Fair, in 1912, the Zoo was removed from Fair Park and relocated to its current location Marsalis Park (purchased by the City in 1909) in Oak Cliff. The Zoo grew rapidly and a large and varied collection of animals were obtained mostly through donations from civic groups and private citizens. The Zoo then became an educational facility rather than a mere collection of assorted animals. Today, the Dallas Zoo, a 106 developed acres is home to more than 2,000 animals. The Zoo is thriving with new exhibits such as the Koala Walkabout presented by Kimberly-Clark Corporation, SOAR, A Festival of Flight, and the Giants of the Savanna to name a few. an educational facility rather than just a normal zoo, nice! looking at the map it is quite huge, it may take a day to roam around and enjoy also those educational programs within the zoo..
wow. i never knew you are in abroad miss tess. indeed it's filipino bloggers worldwide. god bless with life abroad. I love visiting the zoo as its nice seeing rarely seen animals plus you get a lot of exercise just walking around the zoo. I think 1 day won't be enough for me and my family to enjoy this kind of zoo. I just hope people behind Manila Zoo should read this and do something about it. The Aquarium should have been great for kids. Weekdays could be a great time to avoid big crowds. What you think? Looks big, I hope you able to post more photos of the animals..Hehehe. I also enjoy visiting a zoo and taking their photos. So many animals there to view. wow! Is the whole 106 acres open to the public? I haven't been to a zoo as wide as that. I'm amazed that this zoo is already more than a century old. I love zoos!! Thailand has a zoo safari here of some kind too. I find it very entertaining. I've been to Dallas a few years back, but I didn't have the time to go to the zoo here during my visit. Hopefully the next time I'm there, I will get a chance to do so. Great information! I never been to dallas zoo but thanks for making me knew about it would love to visit there.